A versatile offensive weapon and outstanding rim protector, Marlboro's Chris Doherty (33) has big plans for his junior year. High School basketball is already underway here in the Bay State, and SuiteSports has you covered with 10 hoops stars you absolutely need to know. Assistant Editor Nate Weitzer and Correspondent Matt Feld fill you in on some established stars returning this year. An ESPNBoston all-state selection last spring, Boyce was an absolute force during the Division 1 State Tournament, and he finished the season with averages of 28 points, five assists, four rebounds and 2.5 steals to lead Everett in nearly every category. He’s one of the best shooters in the state and can create his own shot off the dribble. Head coach John DiBiaso gave Boyce more and more freedom as a sophomore and he should have the green light as a more experienced point guard this season. 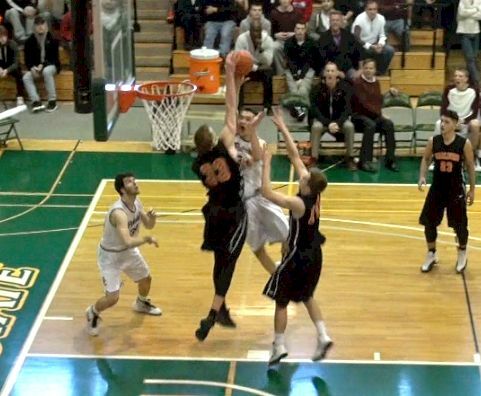 As a freshman, the 6-foot-6 Doherty earned MVP honors in the Mid-Wach B conference. As a sophomore, he earned the award once again with averages of 13 points and 14 rebounds per game, and fought through various injuries to carry the Panthers to the D2 Central Final. While his team fell in a thriller to Concord-Carlisle, Doherty will return to Marlborough High, despite rumors that he might leave for preparatory school. With excellent ball handling and a solid jump shot to go along with his size, length and shot blocking ability, Doherty is drawing plenty of interest from Division 1 colleges, regardless of where he’s playing. The torch will be passed from Putnam mainstay Tyonne Malone to his most likely successor in Martin. He averaged just over ten points per game as a freshman and is looking at a seriously increased role for head coach William Shepard. New England Recruiting Report recognizes Martin as the No. 2 prospect in New England for the class of 2019, and he should play well enough to justify that designation. While he’s a junior, this will be Olivier’s fourth year as the starting point guard for Maynard. He made a significant leap last season to average 12 points per game as a sophomore and lead the Tigers to their first Division 4 State Final in program history. As a 5-foot-11 sophomore, Olivier depended on his quickness to penetrate against defenses and kick, but now he’s 6-foot-3 with impressive length and toughness that should allow him to score and defend at a high level. With Olivier poised to break out, the Tigers are a favorite to return to the state finals and bring home a championship. Athletic point guard and team leader Jakigh Dottin has received plenty of attention from scouts and local media alike, but it was Carrigan’s transcendent play during the 2015-16 State Tournament that allowed the Falcons to navigate a stacked field and bring home the seventh D1 State Title in program history. Carrigan posted four triple doubles with points, rebounds and blocks as a junior last season, and earned offers from Division 1 colleges Sacred Heart and Quinnipiac. At 6-foot-8 with a wingspan approaching seven feet, Carrigan will remain one of the most impactful players in the state on both ends of the floor. Most of last year, Pierre was able to hide behind the success of Eagles point guard Jack Loughnane to peel off some open shots. Now, with Loughnane gone, the focus will fall solely on Pierre, but do not expect a decline in production. The Eagles’ captain has proven an ability to score in a variety of ways, filling it up both from beyond the arc and in the paint. His quick release makes him nearly impossible to contain for any opposing defender, and his length creates a match-up nightmare. Last season Pierre put up outstanding numbers, scoring 19.3 PPG on 48 percent shooting. Defensively, his size fits perfectly with BC High’s zone defense, allowing him to deflect passes and impact double teams when the Eagles go to their full court press. Additionally, it gives BC High a reliable weak side rebounder. Pierre is largely expected to play mostly as the two-guard for BC High this winter, but when starting point guard Travis Evee comes out, there is no reason to think that Pierre cannot handle running the offense. Perhaps the best true talent in all of Massachusetts, Wright comes into the 2016-2017 year following a terrific sophomore season. Wright exploded onto the scene early last winter, showing off a prolific three-point capability, as well as an ability to go to the basket. Over the summer he showed off his explosiveness, often finishing at the rim with a two handed slam. The biggest thing for Wright, however, is his experience playing in key tournament games at such a young age. In last year’s Comcast tournament Wright scored 30 points in each of the Tigers’ two games, to cap off a regular season in which he averaged 24 PPG. Behind his stewardship, the Tigers were able to reach the South Sectional Final and take Catholic Memorial to the wire. Now, with one more year under his belt, there is no reason to expect he cannot get his team back to that point in 2017. Little was known of Coleman until he broke out last January against BC High, pouring in 30 points including four three pointers. Since then Coleman has been an unstoppable force, using his size to attack the basket with his left hand while also showcasing pinpoint accuracy from three point land. Some may question whether Coleman is ready to run the show over in West Roxbury after the legacy that guards like Brandon Twitty and Matt Hanna left behind, but that would be a grave mistake. Coleman became a go-to option in the second half of last season and throughout the entire state tournament, as opposing teams prioritized shutting down Twitty and Hanna, giving him the experience to perform when called upon. This past summer meanwhile, Coleman received a scholarship offer from South Connecticut, which is a mere foreshadowing of things to come this winter. While Dottin is not known for his high scoring output, he is without question the top facilitator in Massachusetts. He has improved not only on his passing and ball handling, but on his mid-range jump shot and his rebounding as well. Give him a slight opening, and Dottin will get to the basket within a blink of an eye. In total, Dottin finished with ten double-doubles on the year last season. One of the more underrated aspects of Dottin’s game is his pure toughness. Facing off against Catholic Memorial’s vaunted full court press in last season’s Division 1 EMass Final, Dottin knifed through the Knights’ slew of aggressive guards, while turning the ball over just a single time. Once in the half court, Dottin enables the pick and roll with dominant big man Dimon Carrigan to go into motion. Cambridge is an odds-on favorite to return to the TD Garden for the third straight season, and Dottin has been at the center of it all since the beginning. Needham is expected to be Newton North and BC High’s top competition in Division 1 South this coming season and Thomas Shaughnessy is at the forefront of reasons why. Shaughnessy left a lasting impact on the rest of Massachusetts basketball at the end of last season when he scored 16 against Durfee and 21 against BC High in the Rockets’ two state tournament games. Now, back leading the Rockets for a second consecutive season, Shaughnessy is looking to take Needham’s program to the next level. His ability as a ball handler out of the shooting guard position is impressive to watch in its own right, but couple that with his step back mid-range jumper and three point shooting, and Shaughnessy instantly becomes one of the top offensive threats in all of Massachusetts. While he may not be the Rockets official “point guard,” expect everything the Rockets do on the offensive end to go through Shaughnessy, as he will be charged with creating shots for others when he becomes smothered by opposing defenses.